These exercises were a well kept secret for over 2000 years, given only to the strictest spiritual disciples. 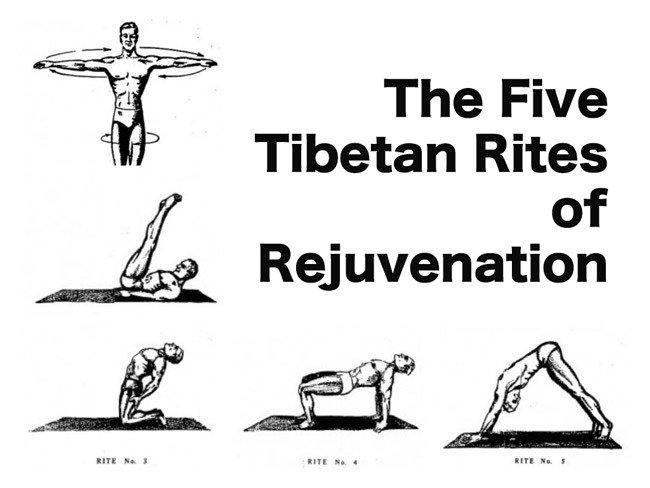 Exclaimed by many to provide anti-aging properties and clarity of mind, the 5 Tibetan Rites are now available for everyone to learn. Originally released to the mass public by a retired British army officer that traveled into the Himalayas to learn directly from the Monks themselves. A book was created entitled “Ancient Secret Of The Fountain Of Youth” describing this amazing exercise and it’s benefits. Peter Kelder, Author of “Ancient Secret Of The Fountain Of Youth”, quoted an explanation from the monks themselves of why this process is so powerful in rejuvenating the people who utilize it. Remember: Consult with your health care provider before beginning any new regimen, especially for those with back, neck, and spinal issues. Always be gentle and do only what feels comfortable for your personal abilities. If any of these poses are too strenuous move onto the next, or try a modified version. For a more in depth look into how to perform these rites please download this free ebook written by Peter Kelder. This book gives a detailed description of each of the rites and how to perform them properly. There is also a free poster available for those who wish to hang a reminder on the wall of the sequence and positions. In this short video series the benefits of each individual rite/exercise are covered.